Citroen are a not manufacturer that could ever be accused of following the crowds. They’re more known for setting trends than they are for simply keeping up with them. However… The car before you is their new C3 Aircross, and as you can see, it’s a mini-crossover. Available to buy from November 2017, it replaces the C3 Picasso. Like so many before them, Citroen have replaced their faithful old MPV with a new and far more fashionable SUV. It’s easy to see why. The C3 Picasso was never going to cut it in a marketplace that now contains the Renault Captur, Nissan’s perennial Juke, Kia’s new Stonic, the Hyundai Kona, SEAT’s forthcoming Arona, and the similarly sized and equally anticipated Skoda Karoq and VW T-Roc, and that’s to name but a few. Look around, you don’t need me to tell you that small SUVs are currently very big business. Needless to say the C3 Aircross comes with all of the signature SUV styling details. Side-mouldings? Check. Large wheels? Check. Short overhangs? Check. Raised ride height? Check? Roof-bars, and chunky bumpers? Check. Endless personalisation options? Oh yes! How does 85 body and roof colour combinations sound? Four-wheel drive? Not quite. Despite its sense-of-adventure-looks the C3 Aircross is front-wheel drive only. But, for an extra £400 Feel and Flair models can be specced with what Citroen calls Grip Control, and Hill Descent Assist. So, together with a set of winter tyres the Aircross should at least get you safely up or down a snowy car-park ramp or out of a soggy festival car park. Grip control works by modifying degree traction control depending upon the terrain apparently, or it can be set to one of Sand, All-terrain or Snow. Nevertheless, sump-guard and anti-slip or not the C3 Aircross definitely feels more suburban that it does sub-continent. Tundra tacking abilities aside the C3 Aircross does at least continue Citroen’s tradition of making both practical and comfy cars. Not only does it seat four six-footers, or maybe two and their three smaller siblings, with ease it’s also spacious enough to cope with a weekend’s worth of their luggage or their fortnightly super-market sweep. The boot’s a good size. Bigger in fact, Citroen say, than that of SEAT’s larger Ateca – if you move the adjustable back seats fully forward that is – and there’s plenty of cubbies and storage further forward too. It’s also been blessed with a very cushy ride. The Aircross’s soft suspension does a sterling job of soaking up bumps and potholes and all the other imperfections we’re told pass for a road-surface these days. It’s also long-legged enough not to feel stressed on the motorway either. It’s not however, handling-wise, the sharpest of things. Whilst it hangs on well and never resorts to excessive body roll, should you feel the need to push it, there’s little enjoyment to be had from doing so. We drove the thrummy and surprisingly engaging and thrifty three-cylinder diesel in range-topping 130bhp guise and although it provides sufficient punch neither the C3 Aircross’s rubbery feeling six-speed gear-change or its similarly springy steering provide enough feedback to ever make you feel fully involved. 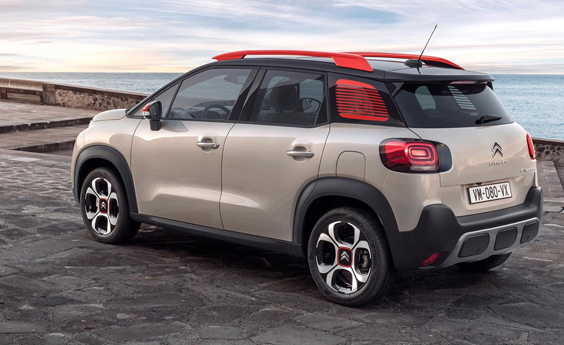 As predictable and composed as the C3 Aircross is, ultimately it’s never something you’d call exciting. Like the chassis the interior too is a tad underwhelming. Standard equipment is a little on the stingy side on the entry level Touch – you’ll need a Flair at least to feel fully equipped – and there are lots of hard and scratchy feeling plastics, especially so on the door-tops. 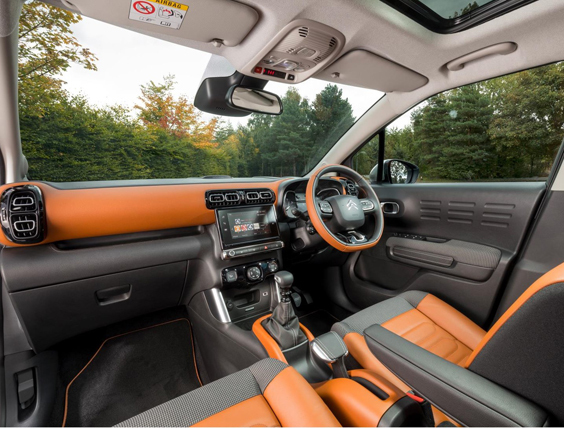 You have to use the touchscreen too to adjust the air-con settings – it’s fiddly. Still at least the seats are comfy, the visibility is excellent, and there are myriad vibrant colour options for those who wish to get creative. Overall, in fact, it’s not such a bad place to be. Like many a Citroen before it the C3 Aircross does indeed have its foibles but all-in-all it plays the whole family mini-SUV role rather well. It’s comfy, practical, competitively priced, and relatively cheap to run. It’s not particularly engaging for the driver but name me an SUV this side of a Porsche Macan that is. 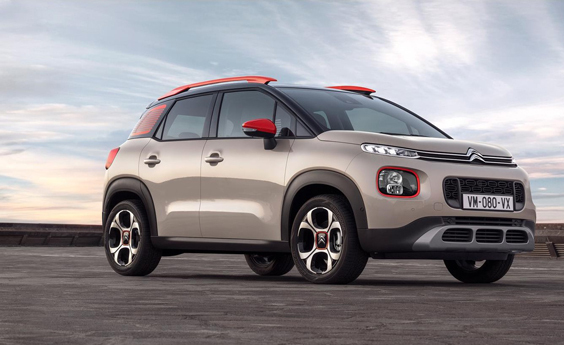 Citroen may have been a little bit late to the party with this one, but in world where generic SUVs are ever more becoming the norm it’s refreshing to know that we can at least thank Citroen for being willing, and brave enough, to once again take the ever-so slightly different approach. Transmission: 6 Speed, Manual, front wheel drive.